This month we’re heading on over to Los Angeles! 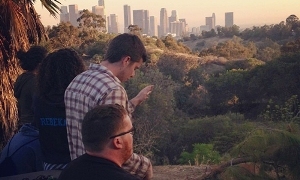 Be sure to visit our city’s page for more information about serving with us in the "City of Angels". The recent terror attacks on Paris and San Bernardino were horrific. Though I was not personally affected by the violence, my heart broke as I watched a country mourn and a city try to make sense of such heinous cruelty. Reactions to the violence of Paris and San Bernardino have been varied. In many ways, people have come together and united in support and encouragement for those affected. However, a more unfortunate outcome of the terror attacks has been a growing fear and division among people here and abroad. There is a growing fear of those in the Islamic refugee community. This fear has begun dividing communities and encouraging a spirit of fragmentation. As followers of Christ we have been given, by God, the ministry of reconciliation. Where there is violence and hate, we are called to bring peace and hope. In 2 Corinthians 5:18-19, it is said that “all this is from God, who reconciled us to himself through Christ and gave us the ministry of reconciliation: that God was reconciling the world to himself in Christ, not counting people’s sings against them. And he has committed to us the message of reconciliation”. We are called to work towards understanding those who are different from us and stand up to the fear seeping into our society. Seeking understanding and educating ourselves is a good first step in the reconciliation process. Reconciliation is a process that requires learning, understanding, and action. At CSM LA, we hope to build bridges with the diverse communities of Los Angeles. One of the ways we hope to do this is by resourcing our groups with tools to help build cross-cultural relationships. We have a crossing cultures orientation our groups go through at the beginning of their week to prepare them for encountering Los Angeles diverse community. Also in January, we are holding an Urban Intensive called “Bridging Racial Divides: Seeking Justice through Social Work and Education”. During the week-long program, individuals will learn about racial tensions and injustices that play out in Los Angeles. They will discover ways to combat injustices through the social work and educations systems. Through these programs, we hope to educate students about different communities and equip them with resources so they can actively bring about reconciliation in their communities. Taking action looks different in every community. Seeking reconciliation may look like educating yourself on the different cultures in your community and on the challenges their communities face. It may also look like standing in solidarity with those who are different than you and supporting their causes. Racial reconciliation may look like praying for justice and unity for the different people in your society. Whatever steps God is encouraging us to take, we must be faithful in bridging divides and allying ourselves those who do not have as loud a voice in society as we do. Follow CSM Los Angeles on Instagram! Become a Facebook fan of CSM Los Angeles! Follow CSM Los Angeles on Twitter! Wishing you and yours a beautiful Christmas!! This past year, CSM Chicago posted a blog series called "Interrupted: The Unexpected Movements of God Working Through CSM's Ministry". We have been so fortunate to have numerous stories that shine light on what Christ has done through our students, leaders and partners of CSM Chicago. "One of the things I liked most about serving in Chicago was the interaction with the people. We talked to and served so many different kinds of people from all over the city. We went to the Boys and Girls club and hung out with kids who loved having us there and were sad to see us go. I also loved serving the people directly like during our Meet a Need activity, at Safe Haven food pantry, and 2 Lil Fishes soup kitchen. Once again I was surprised to see how open and friendly the people were. Elizabeth, who was the woman my group met during the Meet a Need activity, started a conversation with us and we ended up talking about some personal things for the next 30 minutes or so. Then at the soup kitchen there was a guy named Mario who talked about everything that was happening in his life and about his family. He was full of joy. With all that said, one of the lessons God taught me during the week was that people, no matter who they are, what they look like or even what situation they are in, are still people just like me. Sometimes we get these ideas and generalizations in our heads and we treat people like they are these generalizations. I’ve learned that we shouldn’t do that because we never know what a person has been through or what they need. We need to be open and willing to give what they need…even if it is just a listening ear. Ever since I've come home I have really looked at all people differently. While I still have generalizations that I'm working on, I see a clearer picture of who a person really is. This helps me not be intimidated by people I don't know and helps me by more patient as well. I'm no longer so quick to judge as I once was and take into consideration what might be going on in someone's life that is affecting them. Since I have been home I've really wanted to keep serving and building relationships with all sorts of people especially those who are different from me. Surprisingly I've also been starting conversations and opening up to people I come across, hoping they open up to me as well. Lastly I've seen how blessed I am and no longer take for granted what I do have, especially if it's not money or possessions but the more important things like two great parents who love and protect me. There are so many ways to serve in Philadelphia (my home city), it's really not that different from Chicago. I hope to keep serving with the organizations we have here, to help all people because we are all important and all made in God's image."